After this spring break, Mickey Mouse might just have a new favorite musical group. Over the break, students from two of the district's middle schools are traveling to Disneyland to perform on stage for park-goers. The West Linn-Wilsonville group will also have the chance to record a classic Disney song. While the group of six Meridian Creek students have only had one chance to perform with the Rosemont group, they are nonetheless excited for the opportunity to get to know each other a little better on the trip. Rosemont eighth-grader Riley Stutznegger said she is most excited to "Be with my friends during the trip. This is a really special group of people." One Meridian Creek student said she already has a few friends in the Rosemont orchestra. In an effort to get to know each other better, some students from the different schools will even share rooms on the trip. "(Both schools taking the trip) helps promote music in our district," Rosemont orchestra teacher Myriam Gendron-Dupont said. "And it gives the kids something to look forward to. It helps make our group bigger and sound better." The trip won't be all about music of course. Students will have a day and a half to play in Disneyland. When they arrive, they'll also have the chance to explore the LA area, sight-see in Hollywood and go to the beach. 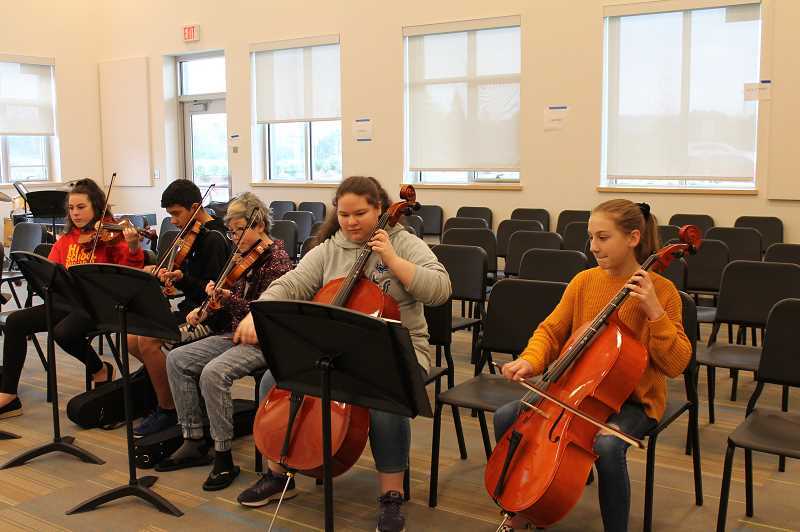 "Orchestra is a great place to be and it's about working together toward something that is going to be mutually enjoyable by all," Gendron-Dupont said. "Hopefully this will be an experience they remember their whole life and it will make them want to keep playing and also keep travelling." This is the first Disney trip for both Meridian Creek and Rosemont Ridge orchestras but the orchestra teachers hope to do it every two years. The plan for this first trip has been in the works for almost a year and a half. Several of the students said the part of the trip they're most looking forward to is the performance. The group will get to perform on the big stage in California Adventure park for families and park-goers. "There's a lot of the students' families who are going on their own arrangements and staying longer, so there will be a lot of families in the audience, but we're also anticipating just a lot of random people, which is why we're hammering the music in," Gendron Dupont said. "We want it to sound as good as possible."